Joe On Sunday we were invited by one of Jennifer's coworkers, G., and his girlfriend, D., to do something quintessentially Swedish: spend a day at a stuga. Not that G. and D. are Swedish themselves, mind you, they're Swiss, but they know a Swede currently working in France, who offered them the use of his stuga while he was gone. 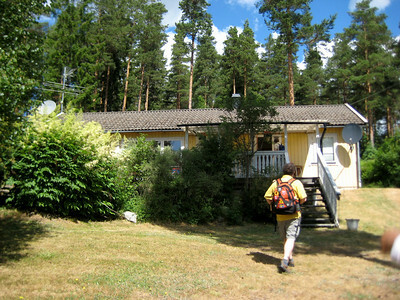 The stuga seems to be the ultimate goal of the typical Swede: a little cabin in the woods to which they can retreat from city life, breathe in the cool clean air of the pine forest, maybe go for a swim in a nearby lake, and basically spend a couple of days roughing it. Mind you, these days roughing it does not mean going without running water and electricity, or even in most cases satellite television and wireless internet. In fact, the Swede who owns this particular stuga is part of a recent trend of people who, in the face of rising real estate prices and the expanding highway system here, are abandoning their apartments altogether and moving full time into their stugas (which does necessitate some winterization for what has traditionally been a summertime-only dwelling). Aside from the increased insulation and the heating system, this seemed to be a pretty typical stuga. It's a one-bedroom cottage painted bright yellow, with a big wood burning stove, some knotty pine panelling, furniture and decor straight out of 1973 (including a massive and, alas, no longer functional cabinet hi-fi). It's located in the sleepy hamlet of Krägga, near Bålsta, about an hour's from Uppsala (but thanks to the E18, only 45 minutes from Stockholm). The neighborhood is all stugas, but each has a yard lined with trees tall enough that you can't see any of your neighbors from the front porch, so you do get a certain feeling of being out in the woods. Anyway, we got there a little before noon, and started the day with a lovely lunch on the front porch. D. made a salad topped with bits of chevre wrapped in bacon, followed by a course of stuffed zucchini and eggplant. For dessert, G. made a strawberry tort. Mmmm. After lunch we wandered down to the lake for a bit. 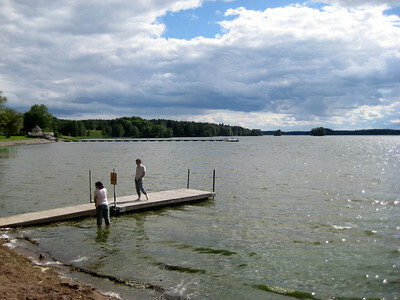 The cabin's only about 200 m from a nice little beach on Lake Mälaren, with a sandy-bottomed swimming area we waded around in for a few minutes. We even had a water snake sighting! After half an hour or so we could see the rain coming, so we headed back to the cabin. We rounded out the afternoon by learning a Swiss card game called Chibre (or Schieber in the German speaking cantons). Chibre is one of the many variants of Jass, a card game which originated in the Netherlands but which became so popular in Switzerland after it's arrival in the 18th century as to virtually eclipse all other card games there. It's a trick taking game played with a 36 card deck, characterized by a distorted ordering in the trump suit (suits normally run A-K-Q-J-10-9-8-7-6, but the trump suit runs J-9-A-K-Q-10-8-7-6). After playing a few hands I think Jennifer and I had the mechanics down fairly well, although it was obvious that our respective strategies were different enough from the expected that G. and D. were somewhat bemused by our odd plays. It was a wonderful day, at the end of which I feel a bit more Swedish (and a little bit Swiss). Oh, and when we got home, we were rewarded with a huge, vibrant rainbow over Flogsta.